Although most digital marketing methods offer tons of flexibility in regards to campaign tone and composition, there’s always a few errors that will push you over the edge. 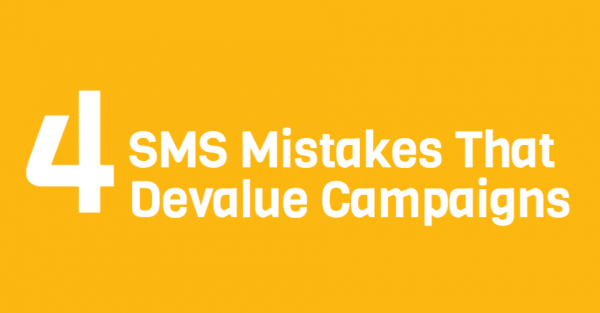 These detrimental SMS marketing mistakes will devalue your brand reputation and credibility. This might sound a bit trivial, but people don’t forget misspelled words. They make you look lazy, unprofessional, and rushed. Schedule all SMS campaigns in advance. This gives you time to review every message before hitting send. Try to stay away from TTYS, CYA, UR, etc. In some instances, they may be acceptable, but if your entire message is composed of shortened jargon, it makes you look unprofessional. You might chuckle, but we’ve seen this happen. Users hype up a mobile promotion, but then completely leave out the actual mobile coupon. This mistake could definitely cost you, as you won’t observe any offer redemption as a result. Every campaign should only have one purpose. Don’t cram in as much text as possible. Stick to one offer, and then call it good. For example, don’t say “Stop in today to get 10% off your order, plus redeem one free order of wings with any large pizza.” That campaign is too distracting, and confuses your subscribers. Instead, stick with one offer and one call to action. That way, if redemption issues occur, it’s easy to pinpoint the problem. These four mistakes will damage your brand credibility, reputation, and loyalty. Long term, people will stop engaging with your campaigns, as they’ll find little to no value in your messages. Partner up with top SMS marketing provider, Slicktext.com. Give us a call today at 1.800.688.6290 to learn more, or hop on over to our pricing page and sign up for a free plan. Our feature rich platform is packed to the brim with tons of dense educational resources. At the end of the day, your success is always our top priority.